We’d love your help. Let us know what’s wrong with this preview of They Say Blue by Jillian Tamaki. Caldecott and Printz Honor-winning illustrator Jillian Tamaki brings us a poetic exploration of colour and nature from a young child’s point of view. They Say Blue follows a young girl as she contemplates colours in the known and the unknown, in the immediate world and the world beyond what she can see. The sea looks blue, yet water cupped in her hands is as clear as glass Caldecott and Printz Honor-winning illustrator Jillian Tamaki brings us a poetic exploration of colour and nature from a young child’s point of view. They Say Blue follows a young girl as she contemplates colours in the known and the unknown, in the immediate world and the world beyond what she can see. The sea looks blue, yet water cupped in her hands is as clear as glass. Is a blue whale blue? She doesn’t know — she hasn’t seen one. To ask other readers questions about They Say Blue, please sign up. This is one of those books where adult me and child me would have been at opposite ends of the reviewing spectrum. Adult me thinks that this book is simply beautiful. As the main character ponders different colours and imagines herself as a tree weathering the seasons I felt this lovely sense of tranquility. As she and her mother gaze out her bedroom window and wonder what the crows are thinking when they see them I paused and thought about all of the native birds I feed. I often wonder myself w This is one of those books where adult me and child me would have been at opposite ends of the reviewing spectrum. Adult me thinks that this book is simply beautiful. As the main character ponders different colours and imagines herself as a tree weathering the seasons I felt this lovely sense of tranquility. As she and her mother gaze out her bedroom window and wonder what the crows are thinking when they see them I paused and thought about all of the native birds I feed. I often wonder myself what they’re thinking and whether they’ve named me like I’ve named them. I wonder what my name is in bird world. 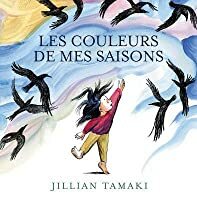 I loved Jillian Tamaki’s illustrations that capture the joy of playing in the ocean, the diversity of a school playground and the majesty of birds in flight. The exploration of colour in the illustrations complements the girl’s musings about various colours along the way. Adult me has read this book three times already but still thinks there’s depth to the story I’m probably missing. Child me (and I’m not ashamed to admit this) would have liked the pretty and colourful pictures but would have wondered where the story was and asked why the girl turned into a tree. Yes, I was a very literal child and I loved my Roald Dahl books so if a story didn’t come with a defined plot and interesting (hopefully interesting and quirky) characters, I’d be a bit “meh” about the book. 3.5 stars. I didn't think I'd like this from the cover, the girl is drawn in a strange way, out of proportion and clumsy but the inside is a lot better. I really liked the illustrations and the quiet poetic text. A nice journey through colours and seasons. Each year my family reads all the Goodreads-award-nominated picture books, and we have been doing this for years. Everyone rates each book and adds a comment and it may (or may not) affect my overall rating. This is book #4 of 2018. Lyra (11): 3.5 stars. I like the color and how you can see what they are talking about. Beautiful book. Hank (12): 1.5 stars. Not good. Harry (13): 4 stars. I love the art and it's very poetic. Jenn (family friend): 5 stars. I love Jillian Tamaki's art work! Her illustr Each year my family reads all the Goodreads-award-nominated picture books, and we have been doing this for years. Everyone rates each book and adds a comment and it may (or may not) affect my overall rating. This is book #4 of 2018. Jenn (family friend): 5 stars. I love Jillian Tamaki's art work! Her illustrations are gorgeous--vivid, dreamy, lush. The narrative is composed of moments. I like the strangeness of Tamaki's book. Tara: 3 stars. I like the color contrasts and all the vibrant colors. Incoherent, if you ask me or my son. 3.5 stars. Kind of sweet and meditative, as a young girl sees colours all around her. Felt a little light, and left me wanting a little more out of this little book. Am I missing something?? The art is beautiful. The beginning was wonderful, but the text and story (if you can call it that) are terrible! I thought it was unfocused, disjointed and too long. The beginning starts out so nicely: blue sky, blue water...except when you look at water in your hand! Then it's clear and it sparkles in the sun! This is how the rest of it goes: A field looks like an ocean. I wonder if I could sail on it. Storm, nevermind. It's cold. Now it's warm. I'm a tree. It's summer Am I missing something?? The art is beautiful. The beginning was wonderful, but the text and story (if you can call it that) are terrible! I thought it was unfocused, disjointed and too long. The beginning starts out so nicely: blue sky, blue water...except when you look at water in your hand! Then it's clear and it sparkles in the sun! This is how the rest of it goes: A field looks like an ocean. I wonder if I could sail on it. Storm, nevermind. It's cold. Now it's warm. I'm a tree. It's summer, fall, winter. My hair is black and my mom braids it as we look out the window. Crows. Oh, this is so beautiful. Yes, as reviewed, the narrative is less a narrative and more contemplative, but the sounds of the words combined with the art is actually breathtaking. It's full of movement, yet at the same time still and calming. This is so gorgeous. Here’s your first 2019 Caldecott contender. I don't see this as a concept book, but rather as philosophy, as a book that belongs on the same shelf as Zen Shorts. It's an ode to all that colors can mean to an observant, imaginative child. I don't really have much to say about it... I think it either clicks with a reader or doesn't. I'd give it 4.5 stars. I picked up several picture books from the library recently, and while I miss reading them with little ones, I still enjoy a brief dip into this type of book. This one is about a child and her exploration of colors and the natural world. I didn't find the text compelling, but the art is lovely. 2 stars for the text, and 4 stars for the art, is how I arrived at my rating. Winning a Caldecott award has launched the career of numerous illustrators, and Jillian Tamaki's popularity rose after a graphic novel she illustrated, This One Summer, earned a Caldecott Honor in 2015. The artwork for They Say Blue is just as impressive, painting our world in fiery reds and lively greens, serene blues and splendorous golds, a spectacular show of nature's beauty. The paintings would be praiseworthy even without a story. Is the sky blue? Some days it is. 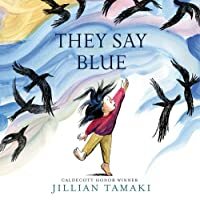 The ocean appears blue mu Winning a Caldecott award has launched the career of numerous illustrators, and Jillian Tamaki's popularity rose after a graphic novel she illustrated, This One Summer, earned a Caldecott Honor in 2015. The artwork for They Say Blue is just as impressive, painting our world in fiery reds and lively greens, serene blues and splendorous golds, a spectacular show of nature's beauty. The paintings would be praiseworthy even without a story. Is the sky blue? Some days it is. The ocean appears blue much of the time, from a distance. Whatever color it is, the water is fun to splash and swim in. Certain creatures of the ocean depths are bluer than we may ever see in person...or will we? Runny egg yolks are orange, and human blood is red, pounding away inside the veins. A field of grass is like an amber sea; you could imagine riding a boat on it, bobbing up and down. The seasons bring new arrays of color: fluorescent flowers peeking up through the cool dirt in early spring, and tree branches sprouting green at the tips. The color palette shifts to red-gold in autumn, and then in winter to blue, gray, and black. But even in the snow and cold, crows are active. The big birds can be seen flying almost anywhere, but no one knows their thoughts. They're part of the mystery of life, desire, and resplendent color touching our world from horizon to horizon. The art is five stars. Gorgeous. On the first few reads, though, the story left me like huh? I thought it was a story about colors, about seasons, which is what I expected. But then it was about a girl turning into a tree and the ending didn't click for me. On the surface, this is hardly a story at all (to be fair, a great many picture books don't really have stories -- just sequences). It took me several reads before I was like oh damn I think I get it maybe. They say blue is the color of the s The art is five stars. Gorgeous. On the first few reads, though, the story left me like huh? I thought it was a story about colors, about seasons, which is what I expected. But then it was about a girl turning into a tree and the ending didn't click for me. On the surface, this is hardly a story at all (to be fair, a great many picture books don't really have stories -- just sequences). It took me several reads before I was like oh damn I think I get it maybe. They say blue is the color of the sky. And at the end of the book the sky is this bold red and orange dotted with black crows. Nice. How do we perceive the world around us? For that matter, how do crows perceive it? I just read this book to a class of kindergarten kids and it was a true winner. First of all the art is gorgeous - so cool to see the range that Tamaki has after enjoying some of her older works like This One Summer. Also the connections to key concepts for younger kids were perfect - colors and seasons and family. The pictures are rich and the text is sparse which keeps the book moving nicely. A lovely read for the young ones. I LOVE this one more than words can say. To so fully capture the magic of both colours and childhood? Jillian, you're amazing. Breathtaking is the only way to describe this book. Intricately detailed, beautifully colored artwork takes the reader through a journey of colors as a little girl explores her world and wonders at how the colors fit into it. Blue is the color of the ocean, yet up close the ocean is clear. The fields of grass look like a golden ocean but it is still only grass. Color heralds the change of seasons, brightly colored flowers in the spring, green leaves in the summer, gold and red leaves that fall i Breathtaking is the only way to describe this book. Intricately detailed, beautifully colored artwork takes the reader through a journey of colors as a little girl explores her world and wonders at how the colors fit into it. Blue is the color of the ocean, yet up close the ocean is clear. The fields of grass look like a golden ocean but it is still only grass. Color heralds the change of seasons, brightly colored flowers in the spring, green leaves in the summer, gold and red leaves that fall in the autumn and the silence of white in the winter. Throughout, deft brush strokes and sketch lines keep this story in constant motion and make the reader feel the childlike wonder of the young narrator. Per usual, Tamaki’s art is the story and will keep young ones fascinated in an exploration of the detail. There's no storyline to this book but I'm assuming its goal is to teach kids different colours. Although this book doesn't have a plot (and we never find out the little girl's name) it incorporates colours into the text and illustrations beautifully. Bonus star for the gorgeous artwork. Tem umas composições tão lindas nas ilustrações desse livro que estou em prantos. Jillian Tamaki te amo! A gorgeous book. Wow. But it was a little too broad- a lack of focus (colors, seasons, feelings, the character becoming a tree for four spreads, existential questions...so much here!) and a jumpy narrative muddy it up too much or me. A tighter focus would have made it shine. Still, a lovely book with a lot to say. This is a beautiful book. From illustrations to text, through and through. My only complaint is a really, really picky one... the whole voice/concept of the text confused me. Who is "they?" Is there any question that the items illustrated are the colors the author includes? The whole, "they say" thread throughout the book seems to imply that the narrator sees something different than others do, but she doesn't. She looks at the sea and sees blue. She knows her blood is red. Etc, etc, etc. I just This is a beautiful book. From illustrations to text, through and through. My only complaint is a really, really picky one... the whole voice/concept of the text confused me. Who is "they?" Is there any question that the items illustrated are the colors the author includes? The whole, "they say" thread throughout the book seems to imply that the narrator sees something different than others do, but she doesn't. She looks at the sea and sees blue. She knows her blood is red. Etc, etc, etc. I just didn't understand who "they" was. "They say," implies that the narrator is questioning the colors around her, but instead she seems to be admiring the colors. Very picky of me though, for such a vibrant, clever book. A gorgeously illustrated picture book contemplating the colors of the natural world. A beautiful use of the rainbow of colors to tell a story full of wonder and stunning imagery as seen through the eyes of a young girl. I loved how she managed to convey the change in time and a change of emotions in various parts of the book. This is definitely worth reading and rereading or just admiring the art. The illustrations are bright and vivid. However, the story just left me wanting more details. I understand that the girl in the story is curious, but I feel like young readers might not get that. The story ended abruptly. This had so much potential, but it just didn't work. The art is dreamy and beautiful, but there is no flow to the story and the words have no rhythm at all. This feels like pages from the artist's idea book, randomly stitched together, and accidentally shipped to the printer before the proper words could be added. Very long review because I loved the art so much but I was so disappointed by the book. First we open with a girl in her bathing suit at the beach, and it talks about how things that are This had so much potential, but it just didn't work. The art is dreamy and beautiful, but there is no flow to the story and the words have no rhythm at all. This feels like pages from the artist's idea book, randomly stitched together, and accidentally shipped to the printer before the proper words could be added. First we open with a girl in her bathing suit at the beach, and it talks about how things that are called "blue" do not always look blue. Okay, that's interesting. I was excited to see where this was going! And then (and I had to go back and check the book, because there was no logical order to this I could not remember what came next) it's talking about orange egg yolk and red blood, and you don't need to see it to know what color it is. (Which, of course, is because you've seen it before from a different egg or maybe a cut on your knee. But the book doesn't talk about that.) So then I think maybe this is going to be an interesting book about colors for preschoolers, and I was ready to be impressed by the unusual delivery, but a little disappointed that it was just going to be a color book. But there are two more pages spent talking about what blood does in your body as you move around which is really interesting to preschoolers but why is it in THIS book and I'm wondering: is this ... well, what IS this? This book has no focus! And then ... randomly ... it's ... autumn? or winter? And the girl is playing in the yellowed grasses and using her imagination and okay that's interesting but holy cow this book is all over the place! After that it's definitely winter (why is it winter??? just a few pages ago the girl was swimming at the beach in summer Is this a seasons book or a color book???) and at this point my 12 year old daughter definitively announced that she did NOT like this book, it's boring. And it is, it's boring! Because it never builds up to anything, it just skitters around from one idea to the next. So, it's winter, and the girl is sad about winter, but hopeful when she sees a purple crocus, so okay I guess this book is still trying to be a preschooler's color book but it's REALLY random and long and it could never hold a preschooler's attention to the end. This book would be a disastrous choice for group storytime. After the purple crocus, the book decides No, I am not a color book, I am an IMAGINATION book - geez, make up your mind, book!! The girl imagines she is a tree, and then there are six random pages about what happens to a tree during the seasons, which is very nice but has no place in this color book, this is going to completely lose little kids. After the tree bit, we are back to COLORS, and the little girl's hair is BLACK and crows are BLACK and then suddenly BOOM that's the END, with no build up to an ending, I was really shocked when I turned the page and discovered that was it. I even flipped back and forth a few times to see if two pages were stuck together. The artwork is excellent. Some of it reminded me of Calvin and Hobbes. The story is fantastical, yet like Maurice Sendak's In The Night Kitchen, I can imagine children accepting it as natural and loving the transformations. Musings on color and seasons. Text is lyrical but not a story in the traditional sense. Meanders as a child often does, and this adds to the meditative quality, but does make it more difficult to follow. Noteworthy acrylic paintings are full of texture and movement. An expressive, quiet first picture book from Jillian Tamaki (This One Summer). As the Kirkus review said, "Neither exactly a book about colors nor exactly a book about seasons, this is a reminder to slow down, savor the present, notice small details, and relish childlike wonder." Jillian Tamaki is a cartoonist and illustrator living in Toronto. A professional artist since 2003, she has worked for publications around the world and taught extensively in New York at the undergraduate and graduate level. She is the co-creator, with her cousin Mariko Tamaki, of Skim and This One Summer, the latter of which won a Caldecott Honor in 2015. She is the author of the graphic novels SuperMutant Magic Academy, originally a serialized webcomic, and Boundless, a collection of short comic stories for adults. Her first picture book, They Say Blue, was released in 2018.